During the last forty years, Subsurface Radar (SR) has been used in an increasing number of noninvasive/nondestructive imaging applications, ranging from landmine detection to breast imaging. To properly assess the dimensions and locations of the targets within the scan area, SR data sets have to be reconstructed. This process usually requires the knowledge of the propagation speed in the medium, which is usually obtained by performing an offline measurement from a representative sample of the materials that form the scan region. Nevertheless, in some novel near-field SR scenarios, such as Microwave Wood Inspection (MWI) and Breast Microwave Radar (BMR), the extraction of a representative sample is not an option due to the noninvasive requirements of the application. A novel technique to determine the propagation speed of the medium based on the use of an information theory metric is proposed in this paper. The proposed method uses the Shannon entropy of the reconstructed images as the focal quality metric to generate an estimate of the propagation speed in a given scan region. The performance of the proposed algorithm was assessed using data sets collected from experimental setups that mimic the dielectric contrast found in BMI and MWI scenarios. The proposed method yielded accurate results and exhibited an execution time in the order of seconds. Subsurface Radar (SR) is a reliable technology that is currently used for an increasing number of nondestructive inspection applications [1–5]. SR techniques are used to image and detect inclusions present in a given scan region by processing the reflections produced when the area is irradiated using electromagnetic waves. Some advantages of SR technology are the use of nonionizing radiation and a highly automated and/or portable operation . Targets present nonlinear signatures in raw SR data that difficult the proper determination of the correct dimensions and locations of the inclusions inside the scan region [6, 7]. This phenomenon is caused by the different signal travel times along the scan geometry and the wide beam width exhibited by antennas that operate in the Ultra Wide Band (UWB) frequency range. To properly detect and visualize the inclusion responses, SR datasets must be properly reconstructed. Several reconstruction techniques have been proposed to form SR images [2, 5–8]. These approaches transfer the recorded responses from the spatiotemporal domain where they were collected to the spatial domain where the data will be displayed. Since SR image formation methods use either the time of arrival of the recorded responses or the wavenumber of the radiated waveforms, the wave speed in the propagation medium is required to accurately map the target reflections to their original spatial locations. 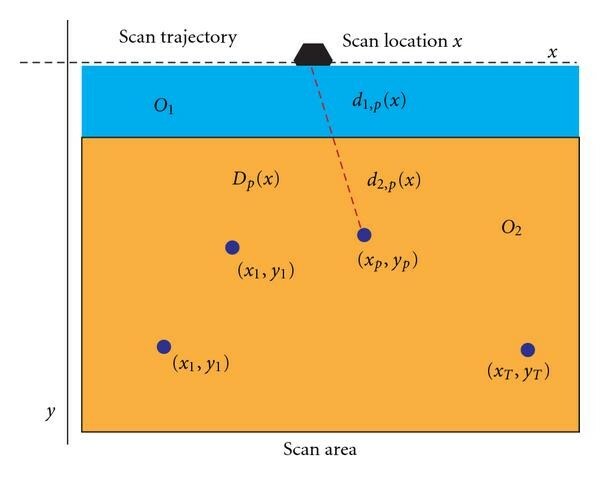 This value can be obtained from offline measurements using a representative sample of the materials forming the scan area or by using an estimation technique. Any errors in the estimate will cause shifts in the location of the reconstructed responses and the formation of artifacts. To determine the propagation speed in SR scenarios, a wide variety of estimation techniques have been proposed. These approaches can be divided into two main categories, focal quality measurement techniques and wave modeling approaches. Focal quality measurement techniques reconstruct the collected datasets using different propagation speed values and calculate a focal quality metric that is used to determine a suitable estimate [9–11]. Wave modeling, also called tomographic, techniques perform a minimization process by solving iteratively Maxwell's equations for a set of possible scan scenarios until the difference between the measured data and the analytical solution satisfies a stop criterion [12–15]. Techniques in both categories have been validated on experimental data, yielding accurate results in far-field SR imaging settings. In the last decade, SR has been used for a series of novel near-field imaging scenarios, such as Breast Microwave Radar (BMR) and Microwave Wood Inspection (MWI). The targets in these applications have sizes in the order of millimetres making necessary the use of large bandwidth waveforms (>5 GHz) to achieve spatial resolution values within this order of magnitude. To the best of the authors' knowledge, only a few propagation speed estimation techniques for this SR imaging setting have been proposed [16–18]. Nevertheless, these methods have some limitations that can potentially limit their use in realistic scenarios. The parametric search proposed in  requires a large number of datasets from the scan region to generate accurate estimates. The wave modeling approaches presented in [17, 18] rely on computationally intensive procedures that result in processing times that can range from several minutes to a couple of days [17, 18], resulting in low data throughput rates. Additionally, the method proposed in  has limited use when the radiated waveform has a bandwidth over 3 GHz, which is quite common in BMR and MWI scenarios. This paper proposes a novel technique to accurately determine the propagation speed in near-field SR scenarios. This technique reconstructs a given dataset using different propagation speed values and calculates the Shannon entropy to measure their focal quality. The value used to form the minimum entropy image is then processed to estimate the propagation speed in the scan region. Entropy metrics have been used for airborne radar to estimate the motion parameters of a given target and in SR to eliminate artifacts in reconstructed images arising from a random air-soil interface [19, 20]. The entropy of a radar image is an indicator of its focal quality. As the image is blurred, the uncertainty in the location and dimensions of a target increases. On the other hand, as the focal quality increases, the uncertainty in the position and size of each inclusion decreases. Therefore, the best focal quality is achieved when the entropy of the reconstructed SR image is minimized . The proposed technique exhibits a number of improvements over standard propagation speed estimation methods for near-field imaging, including lower execution time and the ability to generate accurate results using a single data set. This paper is organized as follows. The signal model is described in Section 2. In Section 3 the proposed approach is explained. In Section 4, the performance of the proposed technique is assessed using experimental data sets. Finally, concluding remarks can be found in Section 5. Consider a linear scan geometry formed by scan locations in the ( ) plane. The problem domain contains targets over the intervals [ ] on the axis and [ ] on the axis and is assumed to have a constant propagation speed . The distance between the scan location and the th target is given by , where ( ) and ( ) are the antenna and the th target coordinates, respectively. In this scan geometry, the antenna element(s) face downwards. where , and it is known as the wave number. Equation (2) is known as the spherical phase function of the scan geometry. Finally, the reconstructed image, , is obtained by calculating the inverse 2D fast Fourier transform of . then the error introduced by the mapping process would produce convex signatures in the spatial domain. Although the length of these target signatures will not be as large as they would have been had been left unprocessed (due to the subtraction of the term in the mapping process), the target signatures still present augmented sizes and nonlinear behaviour. In both cases, the defocusing caused by propagation speed error can be quantified by using the histogram of the reconstructed image magnitude values. Let us consider the case where . In this case, the histogram would contain a series of components corresponding to the different values. As the wavenumber error increases, the length of the nonlinear signatures grows as well. The defocusing caused the target responses to spread among a larger number of magnitude levels in the image. This will result in an increased number of modes in the histogram compared to the image reconstructed using . Therefore, the image sharpness decreases as the magnitude of increases. To illustrate this effect, a simulated data set, , was generated using an SR simulator developed by the authors . 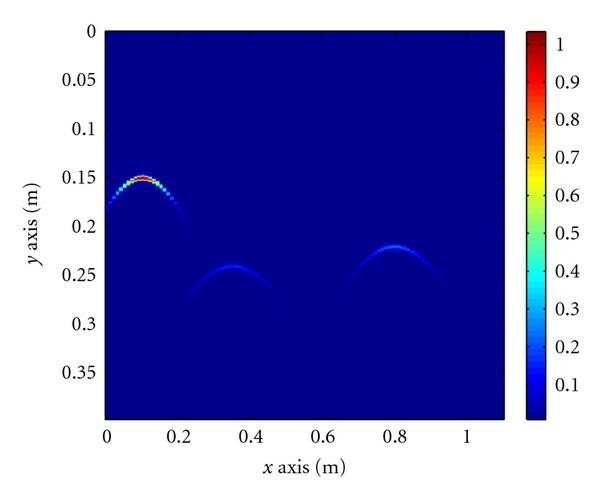 This data set contained three point scatters located at (0.1, 0.15)m, (0.35, 0.24)m, and (0.8, 0.22)m. The irradiated signal was a Stepped Frequency Continuous Wave (SFCW) with a bandwidth of 11 GHz and a center frequency of 6.5 GHz. The propagation speed in the scan region was m/s. The unprocessed data set is shown in Figure 1. The image obtained by reconstructing using and its corresponding histogram is shown in Figures 2(a) and 2(b), respectively. To evaluate the effects in the image when , was also reconstructed using propagation speed values of 1.5 and 1.2 . The resulting images are shown in Figures 3(a) and 4(a), respectively. The histograms of the reconstructed images are given in Figures 3(b) and 4(b). Notice how the target signatures exhibit a concave shape that becomes more elongated as the wavenumber error increases. The number of modes in the histogram grows as the magnitude of increases as well. It can also be appreciated how the location of the targets is shifted upwards as a result of the wavenumber error. (a) Reconstructed data set using . (b) Image histogram. The effects on the reconstruction process when were analyzed by processing using propagation speed values of 0.5 and 0.8 . The resulting images are shown in Figures 5(a) and 6(a), respectively. Their corresponding histograms are given in Figures 5(b) and 6(b). Although the signature size in these images is smaller than in the unprocessed data set, they still have a convex shape. Similarly to when was reconstructed using propagation speed values greater than , the spread in the target signatures causes an increase in the image energy levels. This is reflected in the additional modes in Figures 4(b) and 5(b), compared to Figure 2(a). where are the pixels corresponding to the th intensity level on the image and is the total number of pixels in the image. It can be seen in (9) that the entropy value of an image depends on the pixel intensity distribution. To illustrate the performance of entropy as a focal quality metric, was reconstructed using a set of one hundred different values in the interval ; see Figure 7. The plot of the different entropy values is shown in Figure 8. Note that the minimum entropy value is located at . Entropy values within the interval [ ]. Dual layer scan scenario sample geometry. where and and are the signal travel distance and propagation speed corresponding to the th region, respectively. A diagram for this generic scan geometry can be seen in Figure 8.
where is the average location of the reflections from the scan region surface, . Note that this estimate takes into account the effects of in the signal travel time. The proposed estimation method can be described as follows. Calculate the wavelet multiscale products of the range profile , in the recorded data. The result of this operation is denoted as . Determine the range bin which corresponds to the location the surface. Obtain the denoised range profile, , using the method proposed by the authors in . Reconstruct using the th value in the set , yielding . Calculate the discrete probability density function of the energy levels on the reconstructed image. Determine the entropy value of , , using (10). Repeat steps (6) through (8) for each element in . Determine the value, , in which the minimum entropy value is achieved. where is the range location of the th target centroid, and the is the number of segmented objects in . By using the proportion of over the extension of , it is possible to estimate the value of by determining the propagation speed that yields the reconstructed image with the best focal quality. A block diagram of the proposed method is shown in Figure 9.
where is the wavelength corresponding to the maximum frequency component in . where accounts for the attenuation in the medium. By performing the search process over a 2D search space where and and evaluating the focal quality of the resulting images, an estimate of the attenuation factor in can be obtained. A similar approach was used in  to enhance near-field GPR images. In order to test the proposed method, a SFCW radar system was used. The system consists of a 360B Wiltron Network Analyzer and an AEL H Horn Antenna which has a length of 19 cm. A bandwidth of 11 GHz (1–12 GHz) was used in all the experiments. The system was characterized by recording the antenna responses inside an anechoic chamber. This reference signal was subtracted from the experiment data in order to eliminate distortions introduced by the components of the system. The data acquisition setup was surrounded by absorbing material in order to reduce undesirable environment reflections. The data was reconstructed using a 3 GHz PC with 1 GB RAM. where is the largest dimension of the antenna at its phase center. Since the maximum distance between the antenna and the sandbox bottom is 1.2 m, the targets in all the experiments were at near-field distances. Propagation speed values of the materials used in the experimental setups. Propagation speed values of materials found in BMI and MWI scan scenarios. The first experimental data set is shown in Figure 10(a). In this experiment, two aluminum pipes with a diameter of 3 cm and two steel pieces with a length of 2 cm and a thickness of 5 mm were used. The average separation between the antenna and the sand surface was 10 cms. Figure 10(b) shows the energy of the denoised data. Note that the target signatures are easier to visualize in this image. The clutter in the image corresponds to stationary waves caused by multiple reflections between the surface and the antenna. Nevertheless, the magnitude of these responses is less than half of the magnitude of the target signatures. Figure 10(c) shows the resulting entropy values for the images formed using the values in the search interval. For this experiment, the minimum value is located at m/s. The difference between this value and is caused by higher propagation speed of the air layer (3 × 108 m/s). From the mathematical model of described in (22), an increase in the value of will result in an increased . Substituting the values of , , and in (24) yields a value of m/s, which has a 12% error compared to . The reconstructed image using is shown in Figure 10(d). (a) First experimental data set. (b) Denoised data set. (c) Entropy values for the interval [1 × 108 m/s, 3 × 108 m/s]. (d) Dataset reconstructed using . 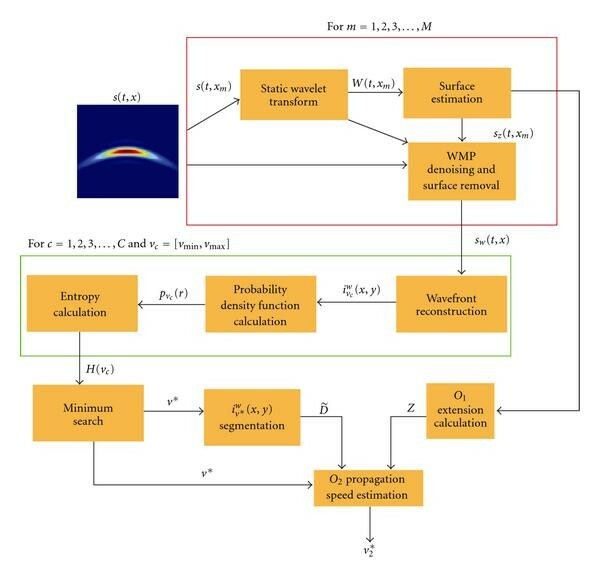 Figure 11(a) shows data collected from the second experimental setup. In this case, the targets were two aluminum pipes with a diameter of 1 cm and a steel plate with a length of 7 cms and a thickness of 1 cm. The average separation between the antenna and the sand surface was 7 cm. It can be seen that the sand surface in this experiment is closer to the antenna, which according to the modeling performed in Section 3 will result in a lower composite propagation speed estimate. Figure 11(b) shows the corresponding denoised image. The entropy values for the search interval are shown in Figure 11(c). The minimum entropy value was located at 2.04 × 108 m/s, and the corresponding propagation speed estimate was 1.63 × 108 m/s. Similarly to the last dataset, the dataset was reconstructed using . The resulting image is shown in Figure 12(d). Notice increased focal quality of these images compared to the previous dataset. These results are consistent with the simulations presented in Section 3. As the error between propagation speed the medium and the estimate decreases, the focal quality of the image improves. (a) Second experimental data set. (b) Denoised data set. (c) Entropy values for the interval [1 × 108 m/s, 3 × 108 m/s]. (d) Dataset reconstructed using . (a) Third experimental data set. (b) Denoised data set. (c) Entropy values for the interval [1 × 108 m/s, 3 × 108 m/s]. (d) Dataset reconstructed using . The recorded data from a third experimental setup is shown in Figure 12(a). In this setup, the same targets than in the previous experiment were used. The steel plate target was moved 7 cm deeper to observe the effect on the propagation speed estimate. The average separation between the sand surface and the antenna was 7 cm. The denoised data can be seen in Figure 12(b). The entropy values for the search interval are shown in Figure 12(c). 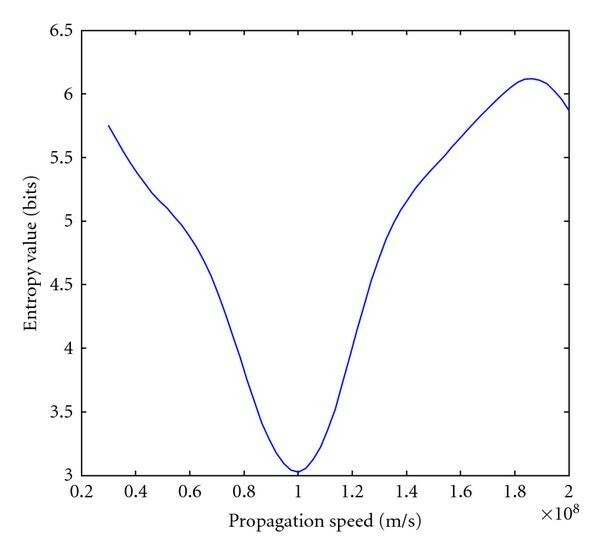 The minimum entropy value was located at 2.17 × 108 m/s, and the corresponding propagation speed estimate was 1.743 × 108 m/s. The reconstructed image using is shown in Figure 12(d). In order to test the proposed method in a different propagation medium, four targets were buried in desert sand ( m/s) . In this case, the targets were aluminum pipes with a diameter of 1 cm. The average distance between the antenna and the sand surface was 6 cm. The recorded data set is shown in Figure 13(a). The result of the denoising process can be seen in Figure 13(b). The search was conducted also in the interval [1 × 108 m/s, 3 × 108 m/s]. The calculated entropy values are displayed in Figure 13(c). The location of the minimum value (2.3 × 108 m/s) was shifted towards the right. This is consistent with the model presented in Section 3, as the wave propagates faster in this medium than in silica sand. The estimated value of for this data set was 1.9 × 108 m/s. The reconstructed image using is shown in Figure 13(d). (a) Fourth experimental data set. (b) Denoised data set. (c) Entropy values for the interval [1 × 108 m/s, 3 × 108 m/s]. (d) Dataset reconstructed using . The performance of the proposed technique was compared to the algorithm described in  which is based on the use of the Hough Transform (HT). This technique offers a good balance between execution time and estimation accuracy. The results of this comparison are shown in Table 3. The HT technique has a higher error and a larger execution time than the proposed approach. Estimation errors and execution times of the proposed method and the HT-based estimation technique for each experimental data set. A novel technique for propagation speed estimation in near-field SR scenarios is presented in this paper. The proposed algorithm focuses the data using initial estimates of the propagation speed on the media followed by the calculation of the focal quality of the reconstructed images using Shannon's entropy as a metric. A clutter removal process is performed on the data in order to allow a more accurate estimation. A search process is performed on the resulting entropy measurements in order to find the propagation speed value associated with the minimum entropy value. The proposed method yielded accurate propagation speed estimates (with an error less that 13%) and has an execution time in the order of seconds. Finally, the proposed algorithm exhibits both lower execution times and estimation errors compared to current noninvasive estimation techniques based on the use of the HT.